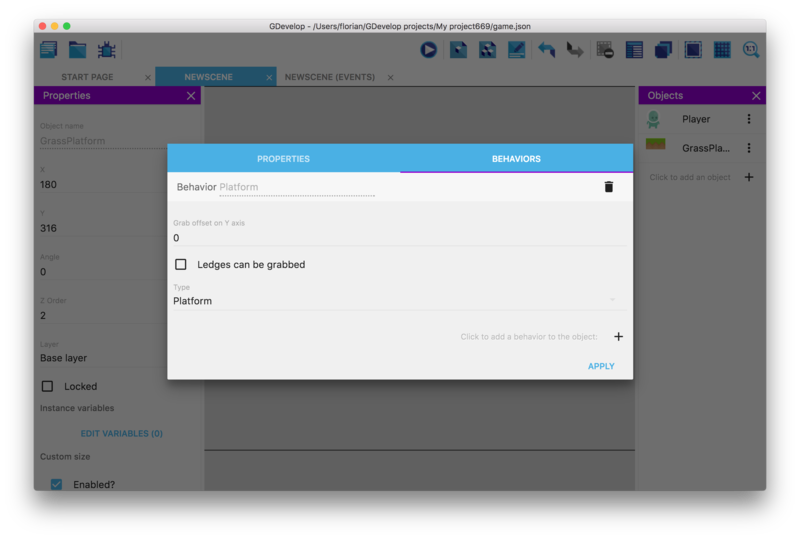 Esse tutorial ajudará você a utilizar GDevelop: Você criará um jogo simples de plataforma onde o jogador poderá pular sobre plataformas e coletar moedas. Note que você poderá ler a página Getting Started para obter uma visão geral do software: a explicação dos principais conceitos e interface do GDevelop. Se você não tiver o GDevelop 5, faça o download do website oficial. Está disponível para Windows, macOS e Linux. Sempre baixe o GDevelop desta página para ter certeza de ter a versão mais recente. 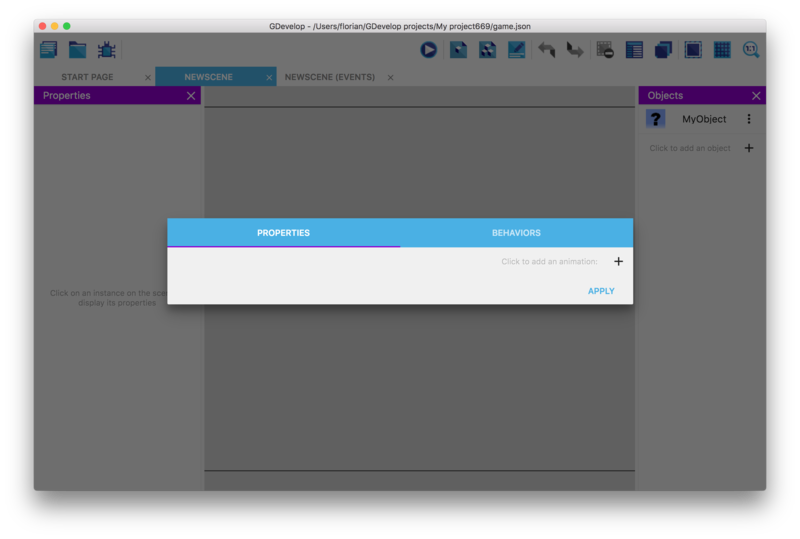 Instale (ou extraia) o GDevelop e inicie-o. Clique em Create a new project (Criar um novo projeto) na página inicial. Na janela, escolha uma pasta para o seu projeto e selecione Empty project (Projeto vazio) para iniciar um novo jogo do zero. Para criar nosso jogo, precisamos ter os assets que possamos usar (o personagem do jogador, algumas plataformas, itens para coletar …). Você pode baixar recursos aqui: http://www.compilgames.net/dl/PlatformerTutorialResources.zip. Depois de baixar esse arquivo, extraia seu conteúdo para dentro da pasta em que você criou o projeto. Cenas são partes do seu jogo. Normalmente, cada tela diferente do seu jogo é uma cena: o menu principal, o menu de pausa e os níveis são cenas. Cenas contêm objetos, que são exibidos na tela. Esses objetos podem ser colocados em cena para criar os níveis (esses objetos são chamados de “instâncias”). As cenas também contêm os eventos que são executados para animar a cena. 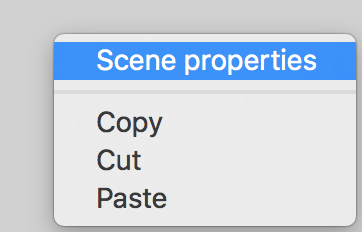 A new scene, called “New scene”, is added to the list. Click on it to open it. The player will be controlling a character that can jump and move on platforms. We're going to create this object. On the right, you can see a panel called “Objects”. 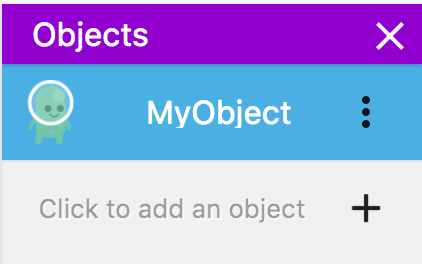 Click on the + button to add an object. A window will pop up displaying different types of objects you can choose from. Different kinds of objects provide specific features. For most of our objects, we will use the Sprite objects, which are animated objects that can be used for a lot of elements (player, platforms, enemies, items…). The object is empty for now. 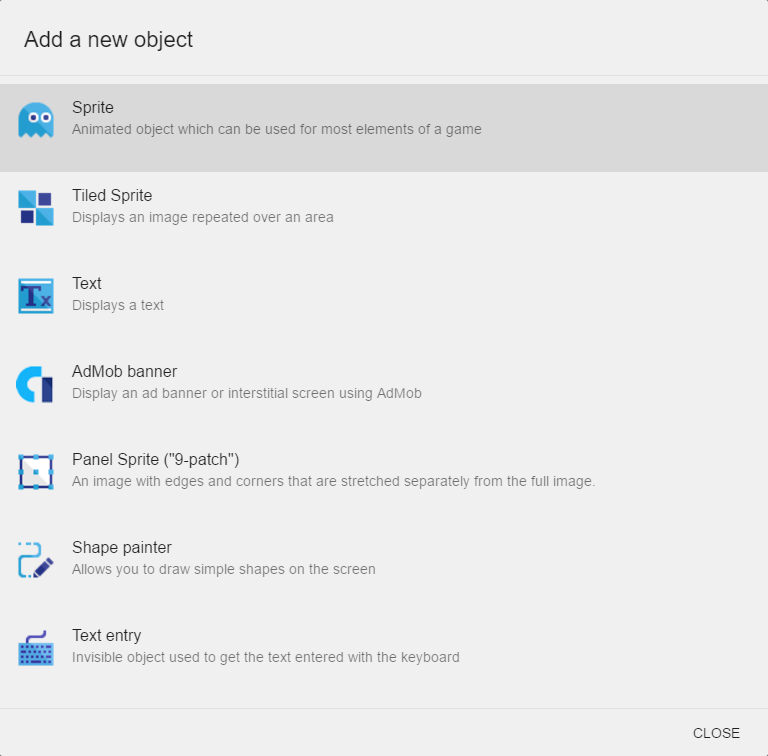 Sprite objects are composed of animations, and each animation can contain one or more images. Let's add an animation! Click on the + button. The animation is added but still empty with no images. To add an image, click on the + in the blank thumbnail. You can now close the editor by clicking the “Apply” button in the bottom right corner. To display the player in our level, we place it in the scene. Each object we add to the scene is called an “instance” of the object. Our player instance will be unique as we are going to have only one in our level, but other objects (like platforms, coins, enemies…) can have multiple instances living on the scene. 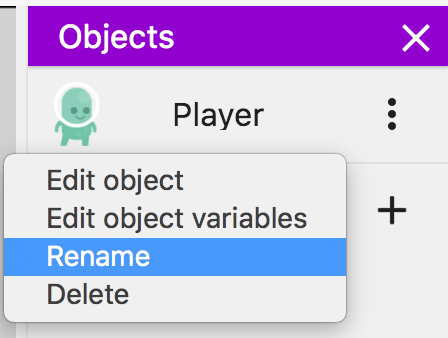 To make it easier to refer to our object, give it a name rather than using the default name. Right click on it (or click on the ⋯ icon) and choose rename. 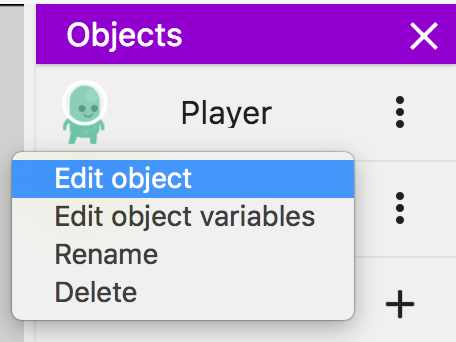 You can then type “Player” and click anywhere on the screen or press Enter to rename the object. The level is still empty for now without any platforms. Let's add some. 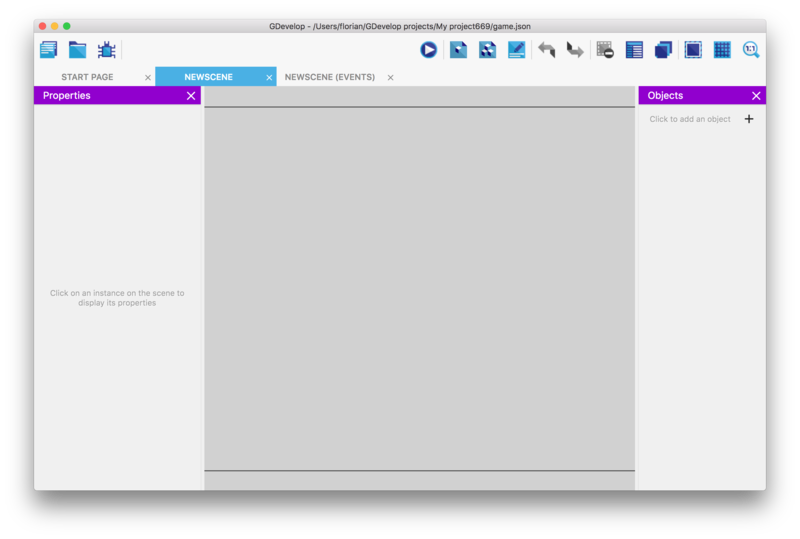 The object editor is opened. It's a bit different compared to the editor of the Sprite object, as Tiled Sprite objects are not animated. Click on Select an image and then on Choose a new image. This time, choose the image called grassHalfMid. Also, don't forget to rename the object to be called “GrassPlatform” instead of the default name. Let's not lose what we've done so far: in the application “File” menu, click on “Save” (or press Ctrl+S/Cmd+S) to save your changes. The movement of the player could be created using the events of GDevelop, but it would be a quite long and difficult task to recreate a good platformer engine. 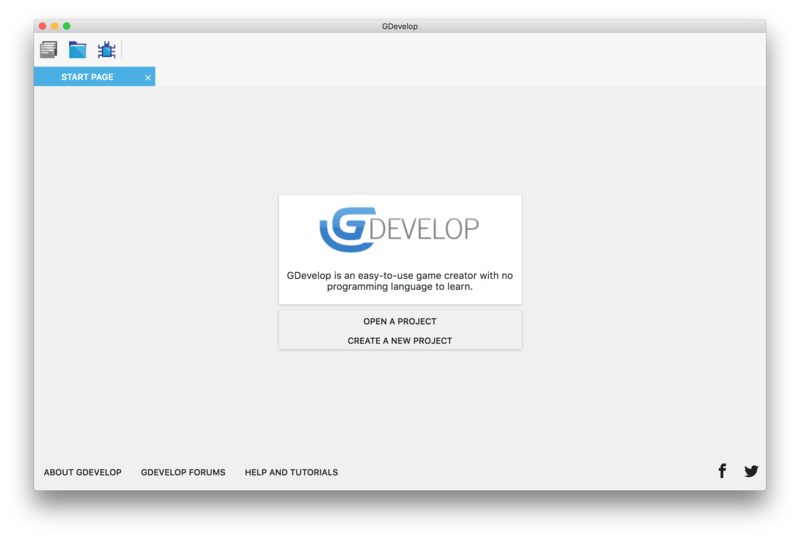 Luckily, GDevelop already comes with a complete platformer engine built-in that we can use. For this, we need to use the “platformer behaviors”, which allow us to access and use the built-in platformer engine. You can change some properties like the jump speed. Set it for example to 800 so that the jump is more powerful. We also need to set objects to be platforms. so the player can walk and jump on them. Otherwise, the player will fall through the object as we didn't tell to our character what to do when they land on it. 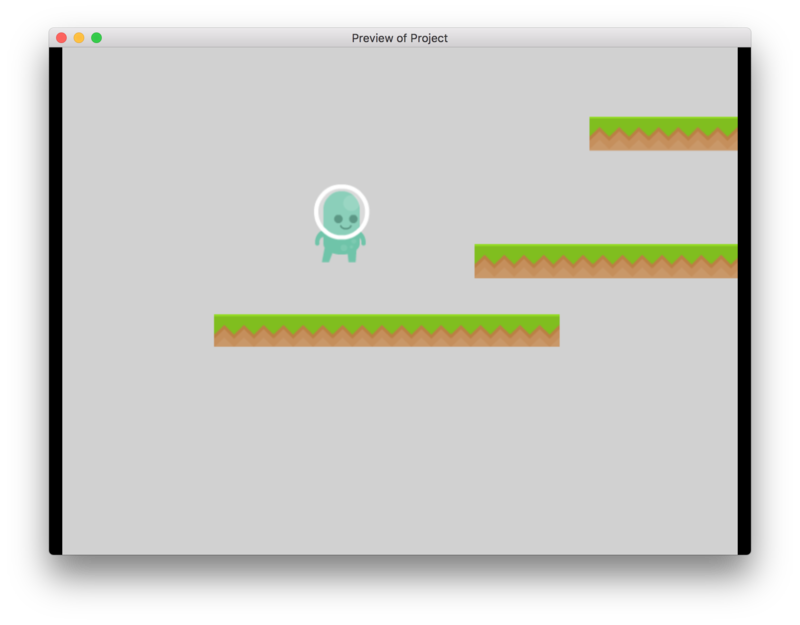 By setting an object to be a platform, the platformer character will collide with it and be able to walk on it. 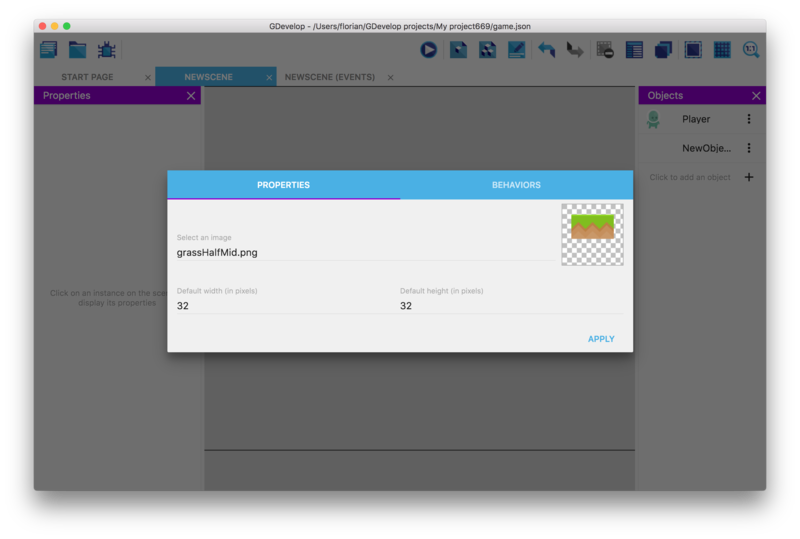 To set the GrassPlatform object to be a platform, open the GrassPlatform object editor. 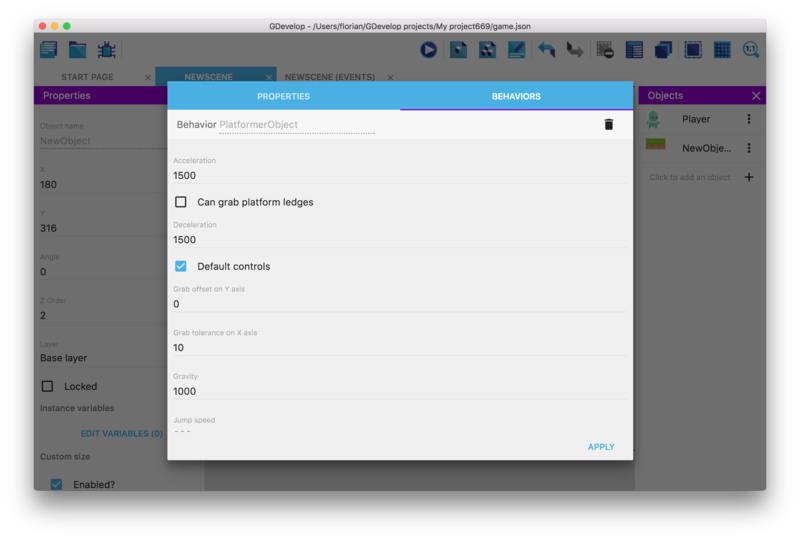 Switch to the Behaviors tab, then add a behavior: this time, choose the Platform behavior. There are also a few options that you can change. For example, the option “Can grab platform ledges” is there to allow the platformer character to grab the edge of the platform. If we enable this option right now, the result will look strange though, as we don't have an animation to be displayed when the character grabs the edge. Let's keep this unchecked. At this point, you should be able to test your game by pressing the “Preview” button at the top of the screen in the toolbar. When you press the button, a preview is generated and just after, a new window is opened. You should be able to walk and jump around using the default keys: move the character with the arrows keys, and press Shift or Space to jump! Feel free to add a few other platforms to the scene as we did before. Make sure you added the behaviors to the platforms, to avoid the character falling through. For now, the object has no animations, we'll add some later. If the object is not moving, be sure that you've added the proper behaviors. 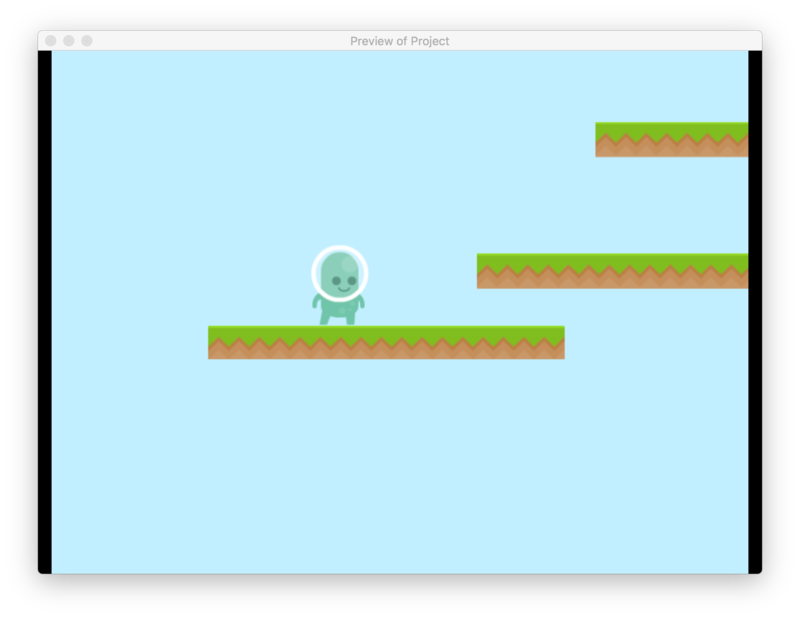 Our game is very basic at the moment, the player is not animated when jumping or running. The next part of the tutorial will show how to add different animations and how to use events to change the animations when the state of the player is changing.